From the humble beginnings of Falconer Hall then on to Glendon Estate, York University has come a long way in 60 years. Throughout the 60th Anniversary Season, kicking off at the spring Red & White Day on March 28, 2019 and concluding at the fall Red & White Day in late-October 2019, we will celebrate our 60 Years of Impact from championing new ways of thinking to becoming leaders in teaching and research excellence. Join us throughout the Anniversary Season as we celebrate our academic and community milestones and participate in the conversation on social media with #YorkU60. 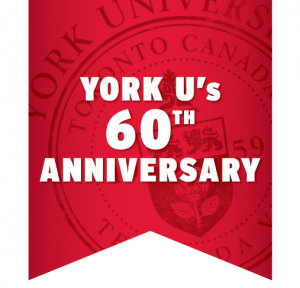 Watch the minute recap of York University's 60th birthday celebrations at Red & White Day! From giveaways, delicious eats, community activation's and much more, relive the exciting time. The late 1950s - the time of our founding - was an exciting period in the history of higher education in Canada. More students were going to university than ever before. In fact, enrolment was expected to double by the following decade - an unprecedented amount of growth. Have a great memory from your time at university? Remember a moment that has shaped your personal or professional life? Share it with us for a chance to be featured. Get your Heritage Clothing now! The York University Bookstore recently launched a new Heritage Clothing line inspired by our history. Visit one of their locations to get your vintage merchandise today.